Nowhere is objectivity in modern science so clearly challenged as in the case of the wildly eccentric moon of Saturn, the one named after the Greek Titan, Iapetus. It is one thing to have the kind of variations in geologic characteristics as are exhibited by the Galilean satellites of Jupiter; it is quite another to have a sufficient number of totally unique features so as to require some extraordinary and highly creative explanations. In terms of anomalies Iapetus is loaded! What pray tell is this? It is not something you get due to light impinging on only one portion of the surface or shadow effects. This is something quite different. Yin/Yang satellites are simply not a common feature of moons in our solar system. When Iapetus was discovered in the 17th century by Giovanni Domenico Cassini (1671 to be exact), he observed with his small refractor telescope the fact that the faint moon was apparently disappearing for a good portion of its 79-day orbit. The satellite would be visible during one elongation (i.e. when it was furtherest from its host planet, Saturn, as viewed from Earth), but then become progressively dimmer as it passed behind the planet. Eventually it would completely disappear as it approached its elongation on the other side of the planet (and was no longer shielded by the planet or its brilliance). As it continued on around and passed in front of Saturn, Iapetus would begin to reappear first as an extremely faint object, and then steadily increase until it again reached its original brightness in its original elongation. This process was repeated every 79 days. Cassini assumed – correctly as it turns out -- that the extreme variations in the brightness of Iapetus had to be due to the fact that one hemisphere of the moon was vastly brighter than the other half – and that furthermore, the moon was synchronously rotating about Saturn with one hemisphere continuously facing Saturn – just as the Earth’s moon always has the same hemisphere facing the Earth. The only distinction was that Iapetus had a 79-day orbit about Saturn, while the Earth’s moon had a roughly 28-day rotation. This unique quality of Iapetus had been known for almost 300 years when Arthur C. Clarke used Iapetus as a major plot element in his novel, 2001, A Space Odyssey. [The novel, by the way, differs from the movie in that the Discovery spacecraft went to Saturn in the novel -- even while using Jupiter’s gravity to slingshot Discovery with increased speed toward Saturn. In the film, Discovery only made it as far as Jupiter – apparently because of time and budgetary constraints.] In the novel, Clarke not only took advantage of Iapetus’ unique surface characteristics – and Saturn’s spectacular rings – but even went so far as to prophesize a huge crater-like ring with a dark object in its center. “Iapetus is a two-toned moon. The leading hemisphere is as dark as a freshly tarred street, and the white, trailing hemisphere resembles freshly fallen snow. Hoagland has also noted “a large (~150 mile diameter), dark, ring-shaped feature… on the side of the moon facing Saturn. In the center of the ring -- almost exactly as Arthur C. Clarke had described it before anyone could have seen it -- was an ‘elliptical white region’… with a black center!”  It’s the sort of thing that can really get your attention, particularly after being attracted to the most astounding planet (in appearance) in the solar system, aka Saturn with its incredible rings. What is not obvious is why Iapetus has a dark side? What mechanisms, natural or otherwise, are responsible for a satellite with such a distinctive feature? Better yet, why would this occur in only a single moon of the solar system? These questions are the reason for delving into Iapetus’ mysteries… but it will take a bit more detail to map out all of the incredible possibilities. Iapetus, with a diameter of slightly more than 900 miles, has an orbit tilted at 15 degrees to these other orbits and lies more than 2 million miles away. The latter distance is very nearly 60 Saturn radii – which is a mystery in and of itself. For the moment, however, we must address the mechanism that yields a satellite in an inclined, and yet very nearly circular orbit. The official “party line” of the creation of planets and their satellites is the “nebular model” wherein the swirling ingredients of a solar and/or planetary system slowly condense from an original cloud of interstellar gas and dust. In general, this means that frictional forces and mutual gravitational attractions tend to “warp” the orbits of the forming planets and/or moons into the general plane of all of the forming objects. High inclination orbits are not readily obtainable from this picture. In the case of Saturn’s third largest moon, Iapetus’ high inclination cannot be easily explained by the nebular model. Instead, one must resort to such ad-hoc solutions as catastrophic collisions and/or interactions with other proto-moons or errant objects. And while this might explain the anomaly, the proposed alternative is viable primarily because of a lack of a better explanation. Of course, if Iapetus was an artificial satellite, finding it in such an odd orbit – as compared to other similarly sized moons of Saturn – solves the problem rather neatly. But for the moment, the collision/interaction theory is the best we can obtain from mainstream science... despite its inherent problems. Equally “coincidental” is the shape of Iapetus’ inclined orbit, and its curiously precise distance from Saturn. On the one hand, Iapetus’ orbit is very nearly a perfect circle, the orbit having an eccentricity of only 0.0283 – i.e. its orbit departs from a perfect circle by slightly less than 3%. Earth’s Moon, by comparison has an eccentricity of 0.0549, or almost twice that of Iapetus. On a planetary scale, Pluto – recently demoted to the status of “dwarf planet” – and Mercury also have high inclinations (>17 degrees and ~7 degrees, respectively) with respect to the other planets whose inclinations are far smaller. But Pluto and Mercury also have highly eccentric orbits (~0.246 and 0.206, respectively, as compared to 0.007 to .093 for the rest of the planets). For Iapetus, the combination of a low eccentricity and a high inclination is unlikely to have resulted from the “random chance” of collisional events. Added to this is the fact that Iapetus’ mean distance from Saturn equals 59.091 times Saturn radius. The tendency of satellites and planets to follow geometrical rules in finding their orbits has been well established by John Martineau in his Book of Coincidence. In this regard, 59.091 is sufficiently close to 60, that one might conclude that the latter distance was the original distance, and that Saturnian/Solar tides and other forces over long periods of time resulted in the difference. This would also explain why the planets depart slightly from the relatively precise mathematical relationships between their orbits. It might also explain why the Moon’s mean distance from the Earth (238,840 miles) is 60.313 times the Earth’s mean radius of 3,960 miles. What is significant about 60 as a multiplier? On the one hand, 60 is a tetrahedral number that suddenly appeared in the Sumerian civilization roughly 60 centuries ago. It thus correlates with the hyperdimensional physics which postulates that a tetrahedron within a sphere would have common points at 19.5 degrees of latitude of the sphere – which in turn leads to the location of Neptune’s blue spot, Jupiter’s red spot, Mars’ Olympus Mons volcano, and Earth’s Hawaiian volcano – as well as Earth’s Teotihuacan ruins. It is highly noteworthy that the sizes of both Saturn and Iapetus, Iapetus’ distance from Saturn, it’s eccentricity, and orbital inclination are all, allegedly, independent variables. In other words, there is no a priori reason for them to be related, or mandated by any current theory of satellite formation. If on the other hand, the “coincidental” interrelatedness is not simply random… Then other theories must be formulated. Then there’s the shape of Iapetus! It’s not like Iapetus is “out of shape”, but rather that it departs significantly from the expected spherical shape. For planets and moons of a certain size and density, mainstream science expects gravity to work its magic and thereby create a nearly spherical shape. This shape is subject to centrifugal forces – which in turn depend upon the rotational speed of the moon or planet and which can cause a slight flattening of the poles. For example, the Earth is slightly oblate because of its rotation every 24 hours. Iapetus, however, rotates at a very leisurely 79 days, making the effect of centrifugal forces in flattening the poles practically nonexistent. Iapetus should be by most standards pretty much a sphere – not unlike Ganymede, Europa, Titan, Io, and all the other more traditional satellites. A first impression of Iapetus is that it has been slightly squashed, on the order of 50 miles – i.e. the poles are about 50 miles closer to the center of the moon than they would be had Iapetus been a perfect sphere. 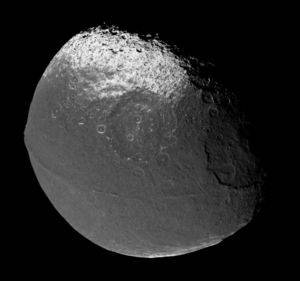 This squashing can be compared to Iapetus’ diameter of roughly 900 miles (leaving a squashing percentage of about 5%). This in turn can be compared to Earth's relatively high rotational speed and a squashing percentage of 0.34% (i.e. 27 miles out of 7927). These measurements in miles become: 464.25 x 465.4 x 442.8 with a mean radius of 457. What is incredible is that in the images returned by the Cassini space probe from a distance of ~77,000 miles, one can actually see with the naked eye a series of straight lined horizons. From a cross sectional viewpoint, one can see that within the range of measurement error, each of the flat horizon segments form with the two radii an equilateral triangle – with three perfect angles of 60 degrees. (There’s that 60 again!) If further measurements keep up this trend – and it would be actually surprising if they did not – then the cross sectional view of Iapetus becomes a rather precise six-sided figure, a hexagon! Of course, the Nature bucket was not 25,000 kilometres across or large enough to fit four Earths inside it – nor does the pole region of Saturn constitute a cylindrical bucket. But hey, the physical principals are still the same, right? Well, maybe. Extrapolations from the micro to the macro (and vice versa) do have a tendency to create wholly different results. One example is metals such as gold where the process of creating smaller and smaller clusters of elements result in the extraordinary results of Microclusters, where characteristics such a conductivity slowly fade away. Accordingly, extrapolating from the Nature bucket to the pole region of Saturn can be risky at best. It may be true that Saturn’s giant polar hexagon is a perfectly natural phenomenon. It may also be true that something else highly significant is happening. Meanwhile, Nature’s next mission (should they choose to accept it – and later disavow any knowledge of it… hopefully before their much used tape self-destructs) will be to spin a sphere and through some natural process create a hexagonal shape from the sphere – and thereby duplicate just a bit closer the observed features of Saturn and/or Iapetus! In the process of course, one will have to consider the mass, density, and homogeneity (or lack of the latter). There is, for example, absolutely no justification (other than to simplify the mathematics or conceptual view) in assuming that the mass of Iapetus is distributed uniformly. In fact, the far greater probability is that the moon is decidedly non-uniform (just as the Galilean satellites show notable variations in structure). It might be pointed out at this juncture that the Earth’s moon has an average density of 3.34 (i.e. 3.34 times the density of water). This suggests a rocky object, but despite the tensile strength of rocks, the moon’s own gravity has crushed it down to an almost perfect sphere (as seen from Earth) measuring some 2,160 miles across. By contrast, Voyager measured Iapetus’ density to be about 1.21 – only slightly denser than water. Given the likelihood of some rocks in the mix during Iapetus’ formation, this would suggest a primarily water body – and with relatively little tensile strength to resist the gravity of Iapetus to create a spherical body. Water is, in fact, a common ingredient in selected versions of Saturn and Jupiter’s moons – from Europa and Mimas to Enseladus, Tethys and Rhea (the latter four moons that of Saturn). Rhea, for example, is roughly the same size as Iapetus (Rhea’s diameter of 1,528 km as compared to Iapetus’ diameter of 1,436 km), with a mean density of 1.23 (comparable to Iapetus’ 1.21). Rhea is notably closer to Saturn than Iapetus, but Rhea nevertheless shows no deformities in its spherical surface of any significance. It is conjectured that “Rhea has almost homogeneous interior (with some compression of ice in the center)…” Furthermore, “The triaxial shape of Rhea is also consistent with a homogeneous body in hydrostatic equilibrium.”  Rhea is, in fact, pretty much what one might expect of a moon of Saturn. Rhea also has a synchronous orbit about Saturn, making the round trip every 4.5 days or so. Meanwhile, Iapetus, located almost 7 times further from Saturn than Rhea, has a 79-day rotation, such that any centrifugal force on Iapetus would be relatively insignificant in terms of deforming the body. And if it didn’t occur on Rhea… why is Iapetus’ shape approximate a hexagonal geometry? Better yet, how does a liquid center result in a rocky crust with six flat horizons! One possibility, of course, is that the assumption of consistency in the make up of the moon is wrong. One could, for example, incur the same density with the use of high density materials with substantial tensile strength on the outer portions of the moon, while the interior was composed of notably less dense materials – even low density liquids or even gases. The latter of course raises the specter that Iapetus may have significant voids or hollow spaces within its interior. Okay. Now it’s getting a bit scary… and we haven’t even mentioned “The Ridge” yet. Okay, now we’ve mentioned it. For practical reasons, you really need to see it. Wikipedia’s version is one of the better images – especially for an enlargement. Accordingly, one should visit Wikipedia’s Iapetus. Just hurry back, for all the information that Wikipedia won’t be providing. “There is no viable geological model to explain a sixty thousand-foot-high, sixty thousand-foot-wide, four million-foot-long “wall”… spanning an entire planetary [or lunar] hemisphere… let alone, located in the precise plane of its equator! Scaled according to the surface gravity of Iapetus – which is only 1/40th the strength of the surface gravity of Earth! – a similar skyscraper [as the Dubai tower scheduled for completion in 2008] on the 900-mile-wide moon of Saturn could reach up 15 miles. A “wall-like” structure -- as wide as it is tall – because of strong lateral support, could reach far higher in such a weak gravity field. “The remains of a deep, massive “equatorial reinforcing ring” -- which was used to literally join the two hemispheres of this “artificial moon” together! But before we make that leap, perhaps we should take note of… you guessed it… a few more anomalies. This surface feature, however, is interrupted in a rather dramatic fashion by two “ring-shaped features” – that could in fact be craters. These ring craters, however, are located at the two ends of the dark material that covers two-thirds of Iapetus, and where the dark material forms a relatively precise ellipse. “In traditional planetology, these circular 'impact basins' are attributed to explosive asteroid or cometary collisions (sometimes the resulting excavation later partially refilling with upwelling internal lava, producing 'ring basins' around the central impact uplift). Such features have been photographed over the years on a variety of solar system objects, and come in a variety of sizes -- all attributed to these celestial objects – even ones only a few miles across -- striking at hypersonic velocities, releasing their devastating kinetic energy on impact. “…the odds of two similar-sized objects randomly striking such a satellite twice, on the equator, and precisely 120 degrees apart -- thus producing two 'coincidental' matching 'ring basins' -- are infinitesimal. “These extraordinary odds are compounded, of course, by the fact that the mysterious 'dark ellipse' across the leading hemisphere stretches 240 degrees the other way around the 'planet' -- which is, of course, two 'tetrahedral angles'… The ellipse now begins and ends neatly at the two 'rings'– indicating that they are somehow 'involved' with its creation. One standard technique for studying a satellite is to use radar, even on moons which are mostly water ice. The apparent ice on Iapetus, however, is significantly less reflective than the other Saturn ice satellites, and furthermore, the radar sees Iapetus as a uniform blip – implying no difference between the light and dark sides. Hoagland  has suggested a correlation between Iapetus’ radar characteristics and the technology behind “stealth” aircraft. The latter’s ability to hide from radar is based on two properties: the aircraft’s coating and its geometry. One could, for example, use coatings such as ammonia/ice combinations to absorb the shorter wavelength radar signals. If this is then combined with a geometry that does not directly reflect the radar beam, then stealth becomes very real. This is why the modern F-117 aircraft looks more like a collection of flying pyramids, instead of an apparently more aerodynamic shape. The reasoning for Iapetus’ “anomalously low radar reflectivity” can then be traced to the possibility of its surface coating and surface geometry. It is not a great leap from there to the speculation that the low radar reflectivity is intentional, i.e. 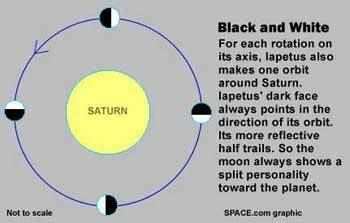 that there was some form of intelligent design at work for the purpose of “hiding” or “highlighting” Iapetus. Importantly, it should be noted that the idea of a “stealth satellite” such as Iapetus does not make much sense for the simple reason that the satellite can be seen in the visible spectrum easily enough. If this fact is then combined with a low radar reflectivity, Iapetus-- instead of becoming less noteworthy to the passing intelligence -- suddenly becomes highly intriguing. Instead of hiding as a natural moon or object, which is what any cautious spacefarer might do, this “moon” suddenly becomes an object worthy of more study simply because of the low radar reflectivity. This constitutes the antithesis of stealth, and more like a billboard for attracting attention. There is a very strong tendency for mainstream astronomy -- and its associated politics -- to rely on the number of craters and other evidence of celestial collisions as a means of estimating the relative age of different planets and/or moons. In fact, the current crop of “surface ages” in the solar system is ultimately dependent upon a benchmark provided by the Earth’s Moon. There is of course no justification for assuming the age of the Moon is correlated with anything else in the solar system – while solar system wide events might have occurred, there would also likely be isolated incidents as well. Furthermore, a quick comparison between the near and far side of Earth’s Moon would lead to the ludicrous conclusion that the two sides of the Moon are of enormously different ages! Part of the reason for such an assumption is the removal from the public’s mind that if celestial bombardment happened billions of years ago, then there is no concern that other episodes might happen next year, or this coming Tuesday. The collision of the Comet Shoemaker-Levy with Jupiter makes it clear that celestial “events” do occur in modern times – despite earlier estimates of the almost infintestimal possibility of such an event occurring. More recently, there has been a strong surge of interest in “Near-Earth Objects”. Clearly, the motivating concern of the latter surge is that an object just might drop by totally unannounced -- and parenthetically, eliminating life as we know it. The fact that the concern might be justified more on the basis of finding a way in which to increase research funding rather than for the creation of an early warning system to save billions of human lives... does not eliminate the fact that modern day celestial events can occur. The circumstance of the Sun Standing Still is one case in point. There is also the very intriguing possibility that Earth’s Moon is a relatively recent addition – even to the extent that ancient legends speak of a time before the Moon took up residence roughly 250,000 miles from the Earth. The fact of the matter is that estimates of age based on some very weak assumptions are likely to be virtually indeterminate. In the case of Iapetus, the extensive “shoulder-to-shoulder” cratering does not necessarily imply that the satellite’s surface is extremely old or dating back billions of years. In fact, one would on a rational or logical basis have to assume that the apparent differences between satellites of Saturn or the entire solar system are due less to their relative ages, than due to the differences in their histories. The problem, of course, is that the differences in histories allows for much more intriguing -- and scary -- possibilities. One of these possibilities is that the traditional nebula model of the solar system may be catastrophically wrong [pardon the pun], and that the history of the solar system may instead be enormously more interesting. There may have been, for example, cycles of periodic, catastrophic destruction and creation of new worlds. It is entirely possible, if not entirely reasonable, to assume that there have been numerous entrances and exits from the solar system stage. The possibility of a former planet located between the planets Mars and Jupiter in the asteroid belt is one case of a possible exit. For entrances, there is the mythology of Uranus being usurped by Saturn, and later Saturn being usurped by Jupiter. Does this imply that Saturn and Jupiter were relative latecomers (Jupiter being clearly the later arrival), but whose arrivals created more than just a minor stir? There is, of course, the myths of Venus being born out of the side of Jupiter. Do these myths and other factors explain in part such anamolies as Uranus’ poles being inclined at a huge angle of 98 degrees from the plane of the solar system? Tom Van Flandern, an expert in solar system celestial mechanics, has provided compelling evidence to support the theory of a solar system undergoing a history of the periodic, catastrophic destruction of whole worlds and the creation of vast clouds of orbiting debris, the latter that ultimately wind up hitting all the other planets (and their moons). Clearly such a model implies that the surface cratering of Iapetus cannot be used reliably to calculate its age. A whole slew of questions about Iapetus are obviously begging to be answered. The good news is that come the fall of 2007, much of what we now know or can speculate about Iapetus may be confirmed, repudiated, or partially supported. For that is when Cassini will be making an up close and personal flyby of Iapetus – and where, hopefully, the space probe (with NASA’s kind indulgence) will be providing hundreds of new images. On the other hand, science is all about predictions, followed by observations to see if the predictions pan out. Accordingly, this is where things really get interesting – and into such realms where NASA, Wikipedia, and other mainstream publications might be very, very hesitant to tread… at least for purposes of public consumption. In other words, it’s Speculation Time! Occam’s Razor says that "All things being equal, the simplest solution tends to be the best one." If that's the case, the far more obvious and simpler explanation for the anomalies discussed thus far is that Iapetus is not simply a naturally occurring object or moon of Saturn, but instead is either an artificial satellite or a natural satellite which has undergone extensive artificial modifications. The equatorial ridge itself, which could be related to the structural characteristics of the surface, or to a mechanism that might provide propulsion for the satellite. Obviously, we’re talking about extraterrestrials and/or intervention by an intelligence in the natural process of the solar system’s evolution. And while angels might be construed as being extraterrestrials (by definition), there has not been a lot of evidence presented where the angels of various religions have been heavily involved in major construction projects on and off world. Accordingly, we may be talking about interventions that carry with them one or more extraterrestrial agendas. Richard Hoagland has provided an enormously entertaining treatment on this very subject at his Enterprise Mission website, under the guise of Moon With a View. While Hoagland’s website is highly recommended for the intrepid truthseeker, the reader should be warned that as of the date of this essay, there were six, long parts to the treatment. Thus the reader should expect to spend a couple of hours reading and marveling – not to mention checking references for the more skeptical crowd. There are, of course, some marvelous graphics. For our purposes, if we assume that Iapetus is either partially or wholly artificial – and constructed/modified by beings other than humans (i.e. extraterrestrials) – then it follows that we must inquire about the nature of the satellite. I.e., what’s it for? There are several possibilities. One speculation is that in the midst of all the planetary destruction allued to in the Van Flandern theory (see above) – not to mention Douglas Adam’s assumption of it being routine to destroy a planet to make way for an interstellar expressway – is that a civilization residing on a planet scheduled for demolition might, if they had the resources, decide to go elsewhere, a new locale hopefully less blessed by exciting times. The key would be a world sized (depending upon time and resources) ark, one capable of transporting all or a significant portion of that civilizations’ citizenry and resources. One notable argument against the ark scenario is that once the ark arrived in Saturnian space, what would it do next? Why not settle on something a bit more stable? The fact that Titan has an atmosphere might suggest that some terraforming might have been in the offering has some appeal. But what about Earth? Wouldn’t a group of pioneers have found the third planet from the sun appealing? Assuming, of course, that Earth existed in roughly its present state at the time of the ark! Hoagland  at first makes a case for the ark possibility – as well as for the idea that Iapetus might have been a warship – but then because of numerous apparent contradictions for either of these two scenarios, decides against them. For our purposes, the ark and/or warship scenario seems the least likely possibility. Any race with the technology and motivation to explore the universe – or even just the solar system or local galactic neighborhood – would almost certainly not do so in an obviously artificial spacecraft. The incredibly sleek ships of science fiction fame just don’t make sense when one is going into uncharted environs where the locals might be just a bit more defensive than one might hope for. Furthermore, when you’re going for a long-haul exploration, you really need to take a lot of things with you. This includes a large number of individual beings in addtion to a whole slew of kitchen sinks. What is not recommended is a small craft with a half dozen members, who will probably find all manner of reasons to learn to hate one another, and where the death of one would be devastating to the mission. The difficulty with the exploration theme is what happened to the pioneers? Did they run into hostilities, have the bad luck of an interstellar collision, or just drive one another bonkers? Why would they leave their home away from home out in the environs of Saturn? Did they simply forget where they had parked it? Probably not. And therefore the best reason to dismiss the exploration scenario is that Iapetus is still here. In fact, the best argument against the ark, warship, and/or exploratory vehicle scenarios is that the end result of either scenario would have to be one of catastrophic failure in order to qualify as a possibility. Of all the possible scenarios of the artificial construct or modification of Iapetus, the one striking feature of this satellite is the number of… well… striking features. Begin with an extraordinary planet, Saturn with its spectacular rings and which is clearly the most prominent object in the solar system. Follow that with a satellite that blinks on and off in its orbit, has a distinctive coloration like nothing else seen, has anomalous radar reflectivity as well, has surface features for those able to obtain relatively close images, combines a high inclination and circular orbit, and so forth and so on. All of these distinctive elements serve a common goal that of motivating any intelligence worthy of the name to look much, much closer at Iapetus. Whether this flashing sign is intended for the inhabitants of the local solar system or for travelers entering from interstellar space, Iapetus is the most distinctive neon sign one is likely to encounter. Even if its artificiality is limited to being nothing more than an alien signpost to get one to drop by and look for clues for the next part of the scavenger hunt, it does serve that purpose spectacularly. Arthur C. Clarke, the great science fiction writer who was above all a scientist (albeit with a creative imagination), clearly recognized the potential for Iapetus. In the case of 2001, A Space Odyssey (a fictional novel in case one is tempted to forget), this signpost was more of a subway entrance sign. The latter, of course, is by far the most speculative suggestion (i.e. the scenario with the least amount of evidence to support it). However, in the process of taking a much closer view, it is clearly the most exciting possibility. In short order, one can note that Iapetus is the only satellite with a spectacular location for purposes of viewing both the ringed planet and all of Saturn’s other moons. Better yet, it keeps this perspective for its entire orbit – with the only significant variation being that the rings are seen on edge twice in the 79 day orbit (but which just makes the view all the more intriguing). 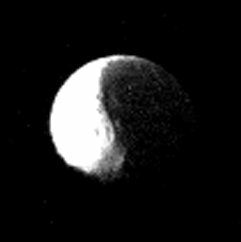 As Hoagland notes, Iapetus can be seen as “an artificially-modified, carefully crafter ‘designer world… to serve as another highly specialized purpose: as a vast, orbiting ‘hotel’.”  While its rates are undoubtedly astronomical [pardon the pun], the fact remains that its ability to inspire and motivate would be very substantial. It’s really the place to be for the jet set (in fact there’s no other way, currently, to get there). It also allows for the classic jest, “the place has great food, but absolutely no atmosphere”. The curious but ironic twist is that Iapetus is named after a Titan – the son of Uranus and the father of Prometheus and Atlas (the latter two who are often claimed to be the “fathers of mankind.” In this sense, Iapetus was an ancestor… a progenitor… of Homo sapiens sapiens. In this sense, of course, it is not necessary to begat the next generation in the traditional manner, but only to provide the seed. Iapetus may have been a seen ship, sent from elsewhere and upon arrival in the local area allowed to disseminate its cargo far and wide. Earth managed to get into the flight path of the seeds, and served as a wonderful place to initiate new forms of life. “It is now known that for most of the history of Earth, the most sophisticated form of life was simple algae – ‘pond scum.’ From about four and a half billion years ago up until about six hundred million years before the Present, a relatively narrow range of algae were the most advanced organisms living anywhere on the planet. “Then, at the boundary between the last two great geological epochs -- known as the great ‘Pre-Cambrian/ Cambrian transition’ -- there was a veritable ‘explosion’ of much more complex life, which formed the pattern for the development of all the future ‘kingdoms,’ ‘phyla,’ ‘genera,’ ‘families’ and ‘species’ that we now recognize on Earth. This so-called ‘Cambrian Explosion’ is without doubt the single biggest mystery of life on Earth -- Save, of course, for the even more mysterious appearance of Life itself. A critical aspect of the Cambrian Explosion is that the proliferation of the forms of life was absolutely incredible! For example, in the early beginnings of the Cambrian Era, there were by “roughly fifty” phyla. Today there are approximately 35 phyla. The key factor is that out of the pond scum arose a wide variety of animal phyla – just the sort of thing that an intelligently planned seed ship might prefer, i.e. animals instead of pond scum (aka football players instead of leaching lawyers). Furthermore, the seed ship could not always be certain of the host planet’s conditions, so that 50 or more phyla were dispatched, but within a few million years, a forth of them might have already paid the price of survival of the fittest. It’s not that any particular phylum was better than others. It’s just that Earth’s phylum, Chordata, was the one to begin wondering about Iapetus. What we’re alluding to here is the possibility that Earth’s burst of creative life stemmed from the arrival of the seed ship, Iapetus, which in turn may have been just one portion of an ancient, extraterrestrial program to convert any number of suitable planetary candidates in parts or all of the galaxy’s outlying solar systems to become hosts to the origin and evolution of life! And not only life itself – certainly a noble goal in itself -- but conscious, intelligent life, the kind you might be willing to bring home to meet mom! Now there’s a divinely inspired [pardon the pun] mission! The idea of Panspermia or Exogenesis is not new, and is considered in some detail by Wikipedia, as well as other webpages on this website. But the ideas that what we have here is directed exogenesis or that the intended panspermia is designed to create intelligent life is somewhat more speculative. For our purposes, it is important to note that the alien signpost, the moon with a view, and the seed ships could easily be all part of the same cosmic package. Create an interstellar seed ship with a huge proliferation of seeds, send it and duplicate ships to a wide variety of potential host planets, allow time to bring forth intelligent beings (the potential for intelligence possibly being built into the seeds), provide a winking neon sign to attract any and all intelligences resulting (from the seeding program) -- specifically intelligences with the technology to discover and then venture to the sign post -- and on top of everything else, have a spiritual and/or moon with a view location just to add to the motivation to go there. And upon our arrival on Iapetus… the next clues to the greatest scavenger hunt ever patiently wait! What in the final analysis is Iapetus? In view of the fact that the final analysis is not yet upon us – not at least until the tentative final Cassini analysis in the fall of 2007 – such a conclusion would have to be considered premature. But the creative juices are flowing. It’s now just a question of the willingness of NASA to consider all of the possibilities and to communicate them to the world. The problem, of course, is the Specter of Revelations and the fact that NASA may for political, economic, and/or religious (aka anti-scientific) reasons, live up to its acronym, “Never a Straight Answer”. In any case, only time, Cassini, and other factors will tell. Stay tuned.